100% INFORMATION LITERACY SUCCESS, 4th Edition, teaches you to develop crucial information skills to succeed in college and the workplace. This book is designed to help you develop skills beyond the classroom, focusing on those skills necessary for 21st century learners and workers. Using hands-on learning activities and real-world applications, the text will teach you how to determine the nature and extent of information needed to solve a problem, how to access the information effectively, how to evaluate the information found, how to use the information for a specific purpose, and how to communicate the information effectively and legally. The 21st century is called as an information era, as information plays a vital role in the lives of individuals and is considered to be the most demanding commodity. This era has witnessed the phenomena of information explosion,information flood, information overload, data smog etc. with the release of too much information, the results of which caused barriers in our lives. Information Literacy is the only solution to this problem which provides skills to know when we need information and where to locate it effectively and efficiently. A present study is a part of the M.Phil dissertation, was done to assess the information literacy of chemical science students, to know their knowledge about information search skills in various environments, and to develop an information Literacy module for these students. Questionnaires were used as a data collection tool and these are distributed to the first year and second year students of the Chemistry Department, University of Pune. 170 questionnaires were distributed among these students. Out of 170 students 130 students gave response to the questionnaire. These 130 respondents became the sample for the present study. Information and Digital Literacies: A Curricular Guide for Middle and High School Librarians is a practical guide to help school librarians design and deliver effective instruction that addresses the knowledge, skills and dispositions of information and digital literacies. This curricular guide from one of America's foremost experts in this area will help librarians prepare students for college and careers. It provides systematic instruction about conducting research and using integration as stated in the Common Core, complying with state and federal mandates for digital safety/competence curriculum, and recognizing the instructional role of school librarians. It should be noted that "canned" programs, particularly for digital safety exist, but they are not aligned with other school standards, and they do not reflect the unique communities of learners, let alone address the need to collaboration and articulation. The ready-to-implement curricular guide features: -instructional design strategies, -model middle and high school curriculum, including a scope-and-sequence, stand-alone courses, units of instruction, and sample learning activities, and -ties to new AASL and ACRL information literacy standards, ISTE technology standards, 21st Century Partnership framework, and Common Core State Standards. People today live in a world of information overload. Each day, information is shared from countless sources through numerous devices. Learning how to handle this onslaught of information has become a vital task for everyone. By the time they reach upper elementary school, most students are using smart phones, tablets and computers to access social media, video websites, online forums, wikis, blogs, and interactive digital games. Students need guidance on how to analyze online information sources, critically think about the content, and apply it to their decision-making. This essential professional resource includes everything that teachers need to help students achieve digital literacy, and includes activities and easy-to-use templates to support teachers as they teach the key skills of analyzing and understanding online information. This book consists of three sections: Finding Information, Analyzing Information, and Using Information. The topics covered include: an introduction to information literacy; search techniques and strategies; asking and answering good questions; thinking visually; organizing information; online civic reasoning; analyzing online sources; using technology to teach; project-based learning with technology. With the amount of online information sources increasing exponentially, this book will equip teachers with the tools they need to help their students become global citizens and 21st century thinkers. How can libraries and librarians across the educational continuum work together to support student transitions from high school to college, utilizing free or low-cost resources? This book supplies the answers. We live in a time when there is more knowledge available to us than ever before. Yet we struggle to make sense of it. When a research deadline looms and all you see is a confusing fog of data, you know you need help. In this sixth edition of Research Strategies, author William Badke helps you make sense of it all. He will show you how to navigate the information fog intelligently, and he will detail how to use it to your advantage to become a better researcher. Badke focuses on informational research and provides a host of tips and advices not only for conducting research, but also for everything from finding a topic to writing an outline to locating high quality, relevant resources to finishing the final draft. Study guides, practice exercises, and assignments at the end of each chapter will help reinforce the lessons. As an experienced researcher who has led thousands of students to ramp up their research abilities, Badke uses humor to help you gain a better understanding of today's world of complex technological information. Research Strategies provides the skills and strategies to efficiently and effectively complete a research project from topic to final product. The six threshold concepts outlined in the Framework for Information Literacy for Higher Education are not simply a revision of ACRL's previous Information Literacy Competency Standards for Higher Education. They are instead an altogether new way of looking at information literacy. In this important new book, bestselling author and expert instructional librarian Burkhardt decodes the Framework, putting its conceptual approach into straightforward language while offering more than 50 classroom-ready Framework-based exercises. Guiding instructors towards helping students cross each threshold, this book discusses the history of the development of the Framework document and briefly deconstructs the six threshold concepts; thoroughly addresses each threshold concept, scaffolding from the beginner level to the intermediate level; includes exercises that can be used in the one-shot timeframe as well as others designed for longer class sessions and semester-long courses; offers best practices in creating learning outcomes, assessments, rubrics, and teaching tricks and tips; and looks at how learning, memory, and transfer of learning applies to the teaching of information literacy. Offering a solid starting point for understanding and teaching the six threshold concepts in the Framework, Burkhardt's guidance will help instructors create their own local information literacy programs. Teaching Information Literacy Threshold Concepts: Lesson Plans for Librarians is a collection designed by instruction librarians to promote critical thinking and engaged learning. It provides teaching librarians detailed, ready-to-use, and easily adaptable lesson ideas to help students understand and be transformed by information literacy threshold concepts. The lessons in this book, created by teaching librarians across the country, are categorized according to the six information literacy frames identified in the ACRL Framework for Information Literacy in Higher Education (2015). This volume offers concrete and specific ways of teaching the threshold concepts that are central to the ACRL Framework and is suitable for all types of academic libraries, high school libraries, as well as a pedagogical tool for library and information schools. Teaching in the Age of Disinformation makes a case for the importance of developing students' intelligent habits of mind so that they become more discriminating consumers of the information that comes at them from the Internet, social media, television and the tabloid press in this "alternate truth" era. Part I sets the stage for the need for an informed citizenry, given the many and varied sources of disinformation that they are exposed to and what the implications are when they are unable to make such distinctions. Part II deals with the specifics of how teachers may develop curriculum activities that call for higher order thinking, within the many and diverse subject areas of elementary and secondary education. Hundreds of examples of curriculum activities are included, as well as suggestions for how teachers use higher order questioning strategies in classroom discussions to enable and promote student thinking. "A pleasure to read," the book draws on the author's long and extensive experience in teaching, writing and research with "teaching for thinking," and offers teachers research-tested ways to incorporate the development of students' intelligent habits of mind in their daily classroom work. Academic librarians are exploring critical information literacy (CIL) in ever increasing numbers. While a smattering of journal articles and a small number of books have been published on the topic, the conversation around CIL has mostly taken place online, at conferences, in individual libraries, and in personal dialogues. This book explores that conversation and provides a snapshot of the current state of CIL as it is enacted and understood by academic librarians. It introduces the ideas and concepts behind CIL and helps librarians make more informed decisions about how to design, teach, and implement programs. It also informs library science scholars and policy makers in terms of knowing how CIL is being taught and supported at the institutional level. The definition of threshold concepts has been expanded over the years based on the work of many educational scholars and practitioners, but are essentially described as a portal, transition, or threshold to additional learning and deeper understanding for a learner. Threshold concepts are transformative, integrative, irreversible, bounded, and troublesome, and can be a valuable tool in both facilitating students'; understanding of their subject and aiding in curriculum development within the disciplines. In 25 chapters divided into sections mirroring ACRL's Framework for Information Literacy for Higher Education—Authority is Constructed and Contextual, Information Creation as a Process, Information has Value, Research as Inquiry, Scholarship as Conversation, and Searching as Strategic Exploration—Disciplinary Applications of Information Literacy Threshold Concepts explores threshold concepts as an idea and the specifics of what the concepts contained in the Framework look like in disciplinary contexts. The chapters cover many disciplines, including the humanities, social sciences, life sciences, and physical sciences, and a range of students, from first-year undergraduates to doctoral students. Implementing the Information Literacy Framework: A Practical Guide for Librarians is written with three types of people in mind: librarians, classroom educators, and students. This book and its website address the implementation of the Association of College and Research Libraries' Framework of Information Literacy in Higher Education. One of the few books written jointly by an academic librarian and a classroom faculty member, Implementing the Information Literacy Framework packs dozens of how-to ideas and strategies into ten chapters specifically intended for librarians and classroom instructors. If you have been waiting for a no-nonsense, carefully explained, yet practical source for implementing the Framework, this book is for you, your colleagues, and your students, all in the context of a discipline-specific, equal collaboration between the library liaison and classroom educator. Implementing the Information Literacy Framework gives you the tools and strategies to put into practice a host of Framework-based information literacy experiences for students and faculty, creating a campus culture that understands and integrates information literacy into its educational mission. Assisting students in locating relevant information remains especially critical in the digital era. As Rempel and Cossarini (2013) remind us the "quantity of conveniently available information has made students less inclined to seek out" information in the library. Information literacy is necessary so that people can continue lifelong learning. It is recognised that basic library skills and IT (Information Technology) skills are the foundations of information literacy competences. Especially for children, who are novices in library use, it is essential to understand how to use the library and how to obtain sufficient knowledge through library materials and information resources on the Internet. Inquiry based learning takes into account the complexity of interrelated knowledge building and strives to provide opportunities for teachers and students for teamwork, building, testing, and reflection on their learning. This book discusses how emerging technologies influence information literacy, and it examines student learning outcomes and educational practices in school systems. Information Literacy: Progress, Trends and Challenges discusses trends in education and psychology which have an impact on information literacy. The authors provide a comprehensive review of these trends and of the expectations thereof with regard to the relationship between "education, learning and higher education; information behavior, emotions, perception and cognition, in a social and individual context; and finally technologies, virtual environments and digital information that impact libraries and their services." Afterwards, the integration of open science concepts in information literacy are examined, suggesting that information literacy is a necessary learning tool. Open science allows for a collaborative, transparent process of creation and dissemination of knowledge based on open access principles. The conclusions drawn from the research project, "Development of the information literacy of university students as support for solving authentic science problems", carried out by the authors from 2013 to 2016, is presented in the subsequent chapter. The overall findings suggest that digital natives were not necessarily information literate, and that information literacy should be systematically promoted through hands-on activities. This book aims to stress the importance of information literacy in elementary education, discuss the scope of learning content that should be implemented within the curriculum, and to describe how the critical attitudes of the conscious media user can be shaped from an early age. The authors describe information literacy purposes and relationships in organizations within the context of the selected theories, and how they theoretically and practically connect. This text provides strategies and techniques for teaching college and university freshmen, community college students, students with disabilities, and those in distance learning programs. It contains approaches to teaching students in the popular programs of study. Media and Information Literacy: An Integrated Approach for the 21st Century provides a novel rationale for the integration of media and information literacy and gives direction to contemporary media and information literacy education. The book takes a synthetic approach to these two areas, presenting critical histories of both. The book explores the influence of political forces and educational practice on media literacy and the contemporary media environment, focusing on computing and mobile technology as a platform for existing and non-computational media. The final section considers a new rationale for the adjustment of content and activities into a combined project, building on a range of skills from contemporary media, reconsidering the mission of media literacy, and advocating that media and information literacy be expanded out of the classroom and positioned as a 'public pedagogy'. Media and Information Literacy in Higher Education: Educating the Educators is written for librarians and educators working in universities and university colleges, providing them with the information they need to teach media and information literacy to students at levels ranging from bachelor to doctoral studies. In order to do so, they need to be familiar with students' strengths and weaknesses regarding MIL. This book investigates what university and college students need to know about searching for, and evaluating, information, and how teaching and learning can be planned and carried out to improve MIL skills. The discussions focus on the use of process-based inquiry approaches for developing media and information literacy competence, involving students in active learning and open-ended investigations and emphasizing their personal learning process. It embraces face-to-face teaching, and newer forms of online education. Today's learners communicate, create, and share information using a range of information technologies such as social media, blogs, microblogs, wikis, mobile devices and apps, virtual worlds, and MOOCs. In Metaliteracy, respected information literacy experts Mackey and Jacobson present a comprehensive structure for information literacy theory that builds on decades of practice while recognizing the knowledge required for an expansive and interactive information environment. The concept of metaliteracy expands the scope of traditional information skills (determine, access, locate, understand, produce, and use information) to include the collaborative production and sharing of information in participatory digital environments (collaborate, produce, and share) prevalent in today's world. Combining theory and case studies, this cutting-edge approach to information literacy will help your students grasp an understanding of the critical thinking and reflection required to engage in technology spaces as savvy producers, collaborators, and sharers. The new ACRL information literacy concepts brings renewed interest in information literacy instruction and skills for librarians. The New Information Literacy Instruction: Best Practices offers guidance in planning for and implementing information literacy instruction programs in a wide range of instructional situations, including: -Course-related instruction -Freshman composition courses -Professional medical education -New course development and delivery -One-shot sessions -Formal, credit courses -Distance education -Visual literacy -and more - As librarians take a new look at information literacy instruction, this essential book will help guide you in creating and maintaining a quality instruction program. 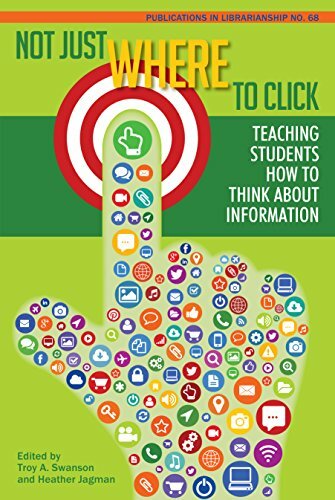 Not Just Where to Click: Teaching Students How to Think about Information explores how librarians and faculty work together to teach students about the nature of expertise, authority, and credibility. It provides practical approaches for motivating students to explore their beliefs, biases, and ways of interpreting the world. This book also includes chapters that bridge the gap between the epistemological stances and threshold concepts held by librarians and faculty, and those held by students, focusing on pedagogies that challenge students to evaluate authority, connect to prior knowledge and construct new knowledge in a world of information abundance. Authors draw from a deep pool of perspectives including social psychology, critical theory, and various philosophical traditions. Contributors to the nineteen chapters in this volume offer a balance of theoretical and applied approaches to teaching information literacy, supplying readers with accessible and innovative ideas ready to be put into practice. Not Just Where to Click is appropriate for all types of academic libraries, and is also suitable for library and information science curricula and collections. What would a synthetic theory of Digital, Media and Information Literacy (DMIL) look like? Radical Information Literacy presents, for the first time, a theory of DMIL that synthesises the diversity of perspectives and positions on DMIL, both in the classroom and the workplace, and within the informal learning processes of society. This title is based on original analysis of how decisions are made about the relevance of information and the other resources used in learning, showing how society has privileged objective approaches (used in rule-based decision making) to the detriment of subjective and intersubjective perspectives which promote individual and community contexts. The book goes on to analyse the academic and popular DMIL literature, showing how the field may have been, consciously or unwittingly, complicit in the 'objectification' of learning and the disempowerment of individuals and communities. Alternative ways of conceiving the subject are then presented, towards a reversal of these trends. he research paper has become so ingrained in higher education that its benefits are assumed to be self-evident, but the connection between student writing and learning is not always clear. Educators frequently discuss the lack of critical thinking demonstrated in undergraduate research papers, but it may not be that students will not invest in writing assignments—it's possible that many cannot with the educational support currently provided. Through theory and examples, and with ACRL's Framework for Information Literacy for Higher Education integrated throughout, Reading, Research, and Writing: Teaching Information Literacy with Process-Based Research Assignments shows just how difficult research assignments can be for novice learners, and offers concrete plans and approaches for building assignments that enhance student learning. In six chapters—including a final chapter on turning theory into practice—Reading, Research, and Writing is an in-depth, interdisciplinary look at the literature in rhetoric and composition studies, reading comprehension, cognitive psychology, education theory, and library and information science that captures what academic librarians and their teaching faculty collaborators should know about reading and writing to improve undergraduate writing-from-sources assignments. The implications for such an understanding include improving students's motivation to research, analyze, and synthesize information at a deeper level; improving librarians's ability to influence effective assignment design among teaching faculty; and opening new avenues of meaningful formative assessment in library instruction. Information literacy and writing-from-sources are important skills for college graduates who leave formal education to be professionals and, hopefully, lifelong learners. Librarians must examine the broader picture that their piece fits within and work across disciplines to produce truly literate—and therefore information-literate—college graduates. Why do we teach information literacy? This book argues that the main purpose of information literacy teaching in higher education is to enhance student learning. With the impact of new technologies, a proliferation of information sources and a change in the student demography, information literacy has become increasingly important in academia. Also, students that know how to learn have a better chance of adapting their learning strategies to the demands of higher education, and thus completing their degree. The authors discuss the various aspects of how academic integrity and information literacy are linked to learning, and provide examples on how our theories can be put into practice. The book also provides insight on the normative side of higher education, namely academic formation and the personal development process of students. The cognitive aspects of the transition to higher education, including learning strategies and critical thinking, are explored; and finally the book asks how information literacy teaching in higher education might be improved to help students meet contemporary challenges. Get the information needed to advocate for the significance of your library! How do you make the case that your library is a valuable instruction center? The Teaching Libraryhelps librarians assess data on information literacy instruction programs so that they can better support the teaching role of the academic library in campus settings. This practical, professional resource features case studies from across the United States and Canada--in both public and private institutions--that offer a variety of evaluation methods. Here are the latest, easy-to-adopt ways of measuring your library's direct contribution to student learning, on-campus and off. With a unique multifaceted approach to questions of assessment, The Teaching Libraryis an important resource that not only offers the latest techniques, but answers the larger question of how to make use of this data in ways that will best advocate information literacy instruction programs. From creating a multidimensional assessment to turning an initiative into a program to teaching and learning goals and beyond, this invaluable text covers many of the core issues those in this rapidly-evolving field must contend with. These contributions reinforce the importance of the learning that takes place in the classroom, in the co-curriculum, the extra-curriculum, and the surrounding community. Some of the key topics covered in The Teaching Library are: assessment practices such as 360° analysis, attitudinal, outcomes-based, and gap-measured integrating the teaching library into core mission, vision, and values statements presenting the message of a library's value to internal audiences of colleagues building momentum--and maintaining it tying information literacy assessment to campus-wide assessment activities identifying and reaching end-of-program learning outcomes assessing the impact of the one-shot session on student learning information literacy instruction and the credit-course model promoting instruction among Library and Information Science educators and many more! The essays in The Teaching Libraryoffer viable and practical ways for librarians to demonstrate their direct contribution to student learning in ways consistent with those accepted as valid across the campus. An important resource for academic librarians and Information Science professionals, The Teaching Libraryis also a useful tool for those in the campus community concerned with developing, funding, and continuing successful library programs--professional staff such as alumni directors; faculty and educators looking to make students more successful; and researchers. Assessment of student learning continues to be an urgent topic in higher education. For librarians who provide information literacy instruction, creating and implementing authentic assessment instruments asking students to "analyze, synthesize and apply" what they learn is especially challenging, since most librarians have little more than an hour in which to teach students and assess their learning. Using Authentic Assessment in Information Literacy Programs: Tools, Techniques, and Strategies offers teaching librarians practical resources and approaches that will help them to implement authentic assessment in any instructional setting. Sections include: oWhat is "authentic" assessment? oAuthentic assessment tools and techniques across teaching modes oHow to adapt authentic assessment to individual library needs oUsing authentic assessment to inform teaching strategies and instructional design Whether you provide one-shot instruction sessions or for-credit courses, in person or online, this book will help you to develop and implement authentic assessment of student learning.